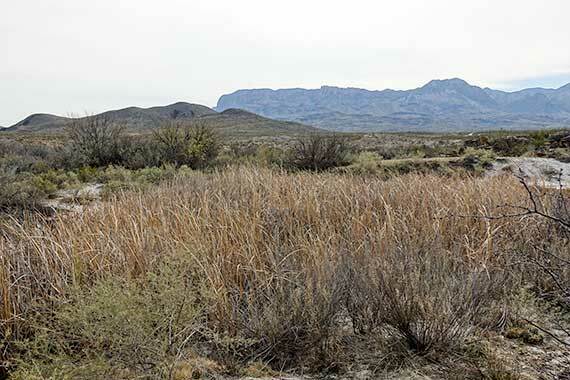 While Croton Spring Trail isn’t the first trail that comes to mind when somebody asks for a trail recommendation in Big Bend, I still like it. 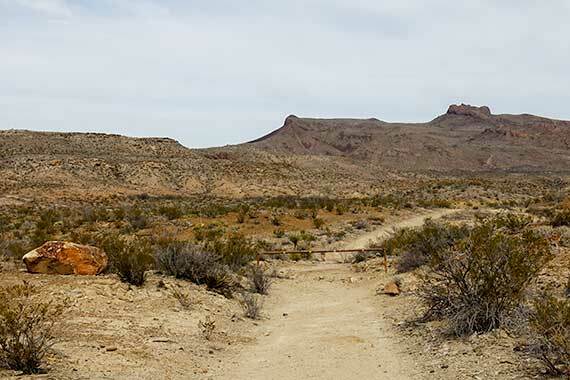 If I’ve been driving around all day (that happens to me a lot in Big Bend) and want to get out and stretch my legs for a bit, it’s a nice, centrally located trail that’s easy to get to from the main road. 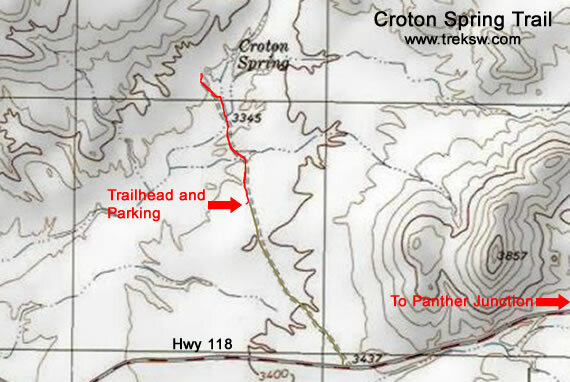 To get to the Croton Spring Trail trailhead from the Panther Junction Visitor’s Center, head left (West) out of the parking lot. It’ll be the third dirt road on your right (29.334313, -103.341474), about 9.5 miles from Panther Junction. You should see a sign pointing to it before you get there. From there, it’s about a half mile drive to the parking area and trailhead (29.339997, -103.345365). Low clearance vehicles should be able to handle this dirt road since it’s very well maintained. The parking area also doubles as a couple of backcountry roadside campsites, so be careful where you park so that you’re not blocking somebody’s access to their camping area while you’re out hiking. The first part of the trail is an old road that the park service has gated off. Just walk around the gate and keep going. Once the road ends, it’ll turn into a clearly marked trail for a little way. The vegetation in this area is fairly typical of what you would see in the lower elevations in Big Bend National Park. As you move further along, the trail will start skirting a small creek, then eventually cross. 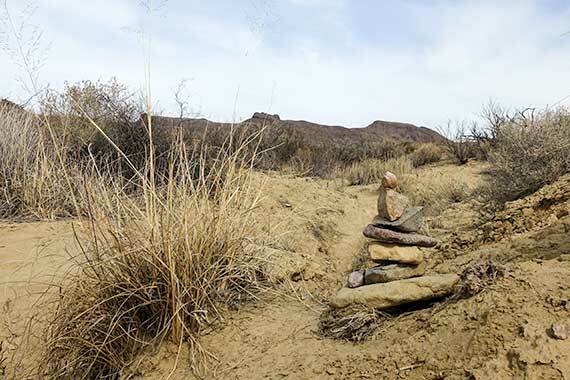 Keep an eye out for the rock cairns. From this point forward, you’ll need them to find your way. A lot of people get disappointed with this trail because they hear Croton Spring and expect water to be bubbling up out of the rocks. That’s not the case here. It basically looks like a small wetland. We couldn’t even get to the water when we were there. It would probably be a great place to set up a blind and watch wildlife. They probably come from miles around to visit this area. 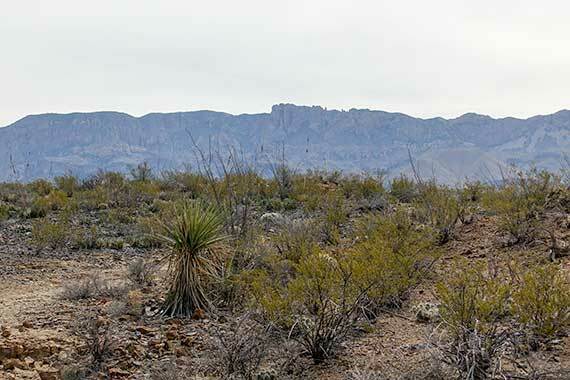 On your hike back, you’ll get a great view of the Chisos Mountains. 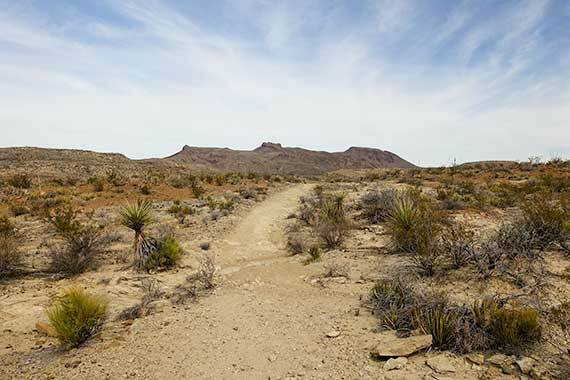 It’s not one of the best hikes in Big Bend National Park, but Croton Spring Trail is easy to get to off of the main road if you want to hop out of your vehicle and stretch your legs after a long day driving. Just don’t expect to see much, if any, water.